These home and kitchen item deals on Amazon all include FREE 2-day shipping with an Amazon Prime membership. If you are not yet an Amazon Prime member now is the time to sign up. You can enjoy a FREE 30-day Amazon Prime trial. Christmas shopping from the comfort of your home is definitely the way to go so grab a cup of coffee for yourself and get ready to shop til you drop! Now here is a really great Cyber Monday Amazon deal that is way too good to pass up. They currently have the 4 Quart Cocotte by Staub on sale for a little less than $100! List price on one of these babies is $407! So if you are looking to add to your Staun collection, or if this is going to be your first piece from Staub, now is the time to buy. The black one is currently on sale, as well as the Cherry color. This non-stick Calaphon cookware set is budget-friendly and has wonderful reviews. If you are looking for another great deal on Amazon for Cyber Monday there is currently a wonderful deal on Rachael Ray cookware. List price of this set is $149.99 and the Cyber Monday Amazon sale is currently $89.99. Here is a great sale that you have to act on super quick because this is actually an Amazon Deal Of The Day! Breville small appliances are currently marked down. Here is a great opportunity for you to get a Breville stand mixer at a great price. If you have a love and passion for baking a stand mixer is an essential tool in the kitchen. Though KitchenAid often comes to mind when you think of stand mixers, Breville has wonderful reviews on this model so you can’t go wrong with that! This stand mixer has 12-speed settings, an illuminated bowl (how neat), comes with both a 5-quart and 4-quart mixing bowl, and a double-sided scraper beater. I currently own a KitchenAid and after scoping this one out I am leaning towards wanting this model instead. It comes equipped with great features and a price that can not be beat. Sometimes I feel as though I am the only person around without an Instant Pot! These nifty cooking tools are popping up all over the place and I see Instant Pot recipes everywhere I look. This is a 7-in-1 device that has some wonderful capabilities! Check out the features below! This is a wonderful starter set of cast iron cookware. With it you will receive 3 oven-safe pans that are 8, 10 and 12 inches, and also 3 heat-resistant holders. These are currently selling on Amazon for $49.95. This is a great Cyber Monday deal on a 6 piece starter set. 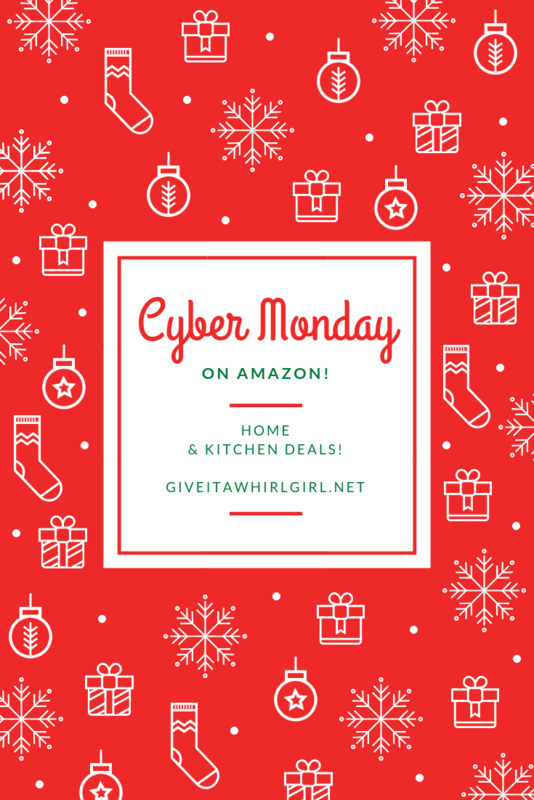 MORE CYBER MONDAY AMAZON DEALS! This Oster Pro 1200 Blender is currently on sale for Cyber Monday on Amazon. This blender has a ton of great features for a really good price. It comes with the blender cup, food processor, attachment, and also a smoothie cup. This Urban Luxe stoneware dinnerware set by Gibson Elite really caught my eye! I am in love with this turquoise blue color. This includes service for four and includes dinner plates, appetizer plates, bowls, and coffee/tea mugs. It is dishwasher and microwave safe as well, which is a big plus! There is a really amazing deal on Amazon for Cyber Monday on this black flatware set. It is currently on sale for $21.59 and there is also a $3 off coupon available on this set. Talk about a steal! This set has a gorgeous onyx black color and includes service for four people. This set includes 4 dinner knives, 4 dinner spoons, 4 teaspoons, 4 dinner forks. and 4 salad forks. It also comes in a beautiful box and is perfect for Christmas gift-giving. Great Cyber Monday deal on Amazon and a coupon for this Hamilton Beach Single-Serve Coffee Maker! It is currently on sale for $71.99 and there is a 10% off coupon that you can clip. You can brew either single serve coffee pods or coffee grounds with this coffee maker. There are also different brewing sizes (8,10, and 14 ounces). Here is an item that I would love to have in my kitchen to assist me with my cooking! This Amazon Echo Show is currently on sale for Cyber Monday and it is selling for $179.99. It usually sells for around $230, so this is a $50 discount on this hot item. If my hubby is reading this today… hint! Hint! I want one so bad! The Amazon Echo Show makes for one heck of a kitchen companion. You can watch instructional recipe videos or you can ask Alexa anything and she will be your guide in the kitchen. Have you found any great Cyber Monday deals on Amazon that were not mentioned here? Feel free to share them because I have not even started my shopping yet! This entry was posted in Shopping Guide and tagged amazon, Breville, Calaphon, cast iron, Christmas, cocotte, coffee, coffeemaker, cookware, Cyber Monday, dinnerware, echo show, espresso machine, flatware, Gibson Elite, gift guide, gifts, Hamilton Beach, juicer, sale, shopping, shopping guide, stand mixer, Staub. Bookmark the permalink. The kitchen is my favorite place to be too. Love cooking for my family. So many great deals!! I’m struggling right now because I KNOW we’ll be making a big move in June so I don’t want to purchase more items that I’ll have to move. At the same time, SUCH GOOD PRICES! Great list! I need some new non-stick cookware because I just tossed mine out due to old age!! So I am happy to see some on sale!! I have a Circulon set of cookware. Very very nonstick! Love a good gadget!! So many great products right here – loving the look of that cutlery set!